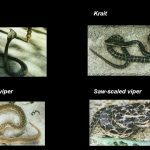 Let me guide you through what I think is the list of 5 most venomous snakes in Australia. Inland Taipan lives in central Australia. Also known as Fierce Snake, Western Taipan or Small-Scaled. One bite can produce 110 mg, enough to kill 100 people. Its venom is quite the same as the Coastal Taipan but with much more weight in the toxic. For comparison: it’s venom is almost 900-times more deadly than the one from a Diamondbach Rattlesnake. Common Brown Snake lives in the arid parts of Australia. Has the greatest venom output and is the heaviest venomous snake in Australia. Referred to also as Mulga. Use of a brown snake antivenom does not work on this snake. Coastal Taipan lives in the NorthEastern and Extreme North Australia, and New Guinea. The Coastal Taipan is very large and fast. It has the largest fangs and the longest body out of all the venomous snakes in Australia. Tiger snake lives only in Australia. Also know as the Eastern Tiger Snake. Sea Krait lives in Australia. These snakes have a large cylindrical body and are strong swimmers. The Sea Kraits are a reclusive type of snakes. Its venom can kill a person in 5 hours after being bitten.